If your Question isn't answered here, Ask us directly! Can I pick up my purchased items (Click + Collect)? Items can be picked up from our Sydney warehouse which is located in Botany, Sydney. We will contact you when your items have arrived and are ready for collection, though please note that the warehouse is open Monday - Friday only (not weekends). Items must be collected promptly. After the initial grace period, storage fees will be charged on a weekly basis. If you are in NSW or the ACT you will be offered 'Click + Collect' as a delivery option on the Checkout pages. Simply select this option and when your item is ready to be collected we will contact you directly with all relevant details. There is presently a small handling fee associated with Click + Collect orders. Our warehouse facilities have full loading dock and forklift facilities and you are welcome to pick up the item(s) yourself or to organise your own courier. Please Note: There is a $9.95 handling fee for all Click +Collect items. To ensure the lowest possible delivery costs we use a mix of couriers that offer delivery to most Australian cities, regions and towns. Delivery is by road only (not by air or ferry). 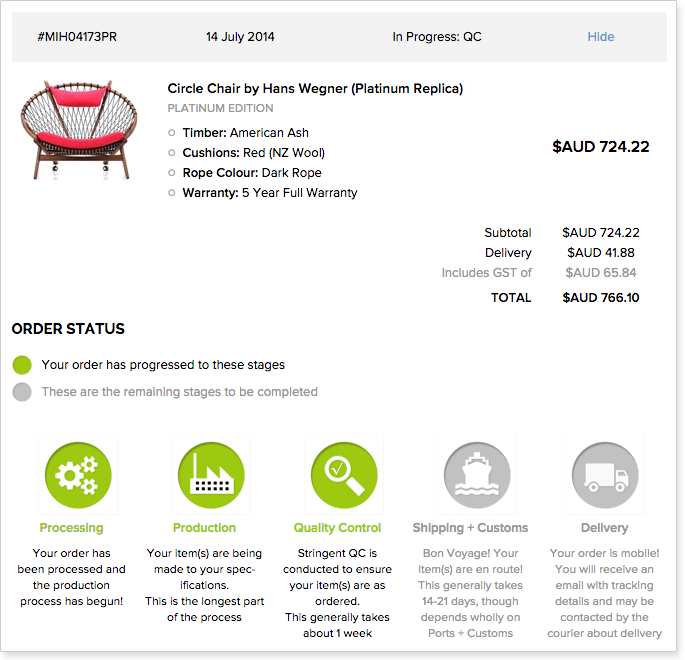 Every product page has a Delivery Calculator (under the "Add to Cart" button), as does the Shopping Cart. By entering your delivery postcode you can calculate in advance the delivery charges that will be added at the Checkout page. Please contact us in advance if you require an assisted delivery service (additional charges will apply). Please note that delivery is to ground floor or entry level with no external steps or internal stairs. Additional charges may apply for stairs, steps, re-delivery or failed delivery (e.g. : address unattended or out-of-service elevators), difficult access or required unpacking of items if cartons will not fit through entry points. Responsibility rests with the recipient that cartons will fit through all entry points. Unpacking and packaging removal is not included. Please also note that some bulky items are packaged with wooden edging. This is a premium level of packaging and is used to protect your items from transportation damage. You will need to remove this yourself and may require a hammer and screwdriver (or similar). Yes, GST is charged on all items and prices are GST inclusive. Your Tax Invoice will include the GST component of your order and our full business and ABN details. Yes we do! Please call us on 1300 797 277 or email [email protected] with your details. As a guide, as our prices are already 'wholesale' or better, you will need to spend $15,000 or more to qualify for a discount. What are the prices 'raw'? And why do they frequently change? Our prices are indeed 'raw'. That is, we calculate the Australian landed cost price (including import duties + GST) then add our (tight) commission and the spreadsheet results feed directly into the website. This is why you'll see prices such as '$421.53' and so forth. Our prices do fluctuate in-line with movements of the Australian Dollar (AUD) vis-à-vis the US Dollar (USD) on the foreign currency markets, and so prices can change on a daily basis. Importantly, if you have purchased an item and the website price subsequently changes while you are awaiting delivery, you will of course pay only the original price at the time of your purchase (you are not exposed to any ensuing price changes). If you have a promotional discount code, please enter it into the Coupon Code box on the Shopping Cart page. This input box is located on the right hand side of the page, above the black 'Proceed to Checkout' button. * Unless otherwise stated, please note that individual promotional coupons are for single use only, per customer, and are not to be used in conjunction with other promotions or coupons. Warranty periods vary though most products come with a Two (2), Three (3) or Five (5) Year Warranty *, making them amongst the most generous within the Australian furniture industry. The Warranty period commences from the date of delivery. Faulty items will be repaired or replaced free of charge. In the event of a major fault, the item(s) can be refunded. Warranties do not cover or protect against wear and tear, inappropriate item use, misuse or abuse. Warranties are non-transferable. The benefits provided by these Warranties are in addition to other rights and remedies of a consumer under the Australian Consumer Law, and any other laws in relation to the products to which this Warranty relates. * Excluding products purchased for commercial usage. Products purchased for commercial use come with a blanket Six (6) Month Warranty. Shop with confidence and surety. The terms of sale of all items offered on Chicicat.com comply with Australian Consumer Law (ACL). For more information on your rights as a consumer, please visit the Australian Consumer Law website. Warranty periods vary though most products come with a Three (3) to Five (5) Year Warranty, making them amongst the most generous within the Australian furniture industry. The Warranty period commences from the date of sale. We get asked this a lot and there seems to be a vague stigma that suggests Chinese produced goods are inferior. Not only is this wrong, it’s outrightly crazy! Where do you think iPads and Nikes come from? There are good and awful products made everywhere though Chinese produced goods are typically of an exceptional quality and (in the consumer goods industries) are regarded as superior to goods made in Bali, India or South America. Over ninety per cent (90+%) of furnishings offered for sale in Australia are produced in China. All replica furniture worth owning is made in China. At CHICiCAT we deal with close to a dozen Chinese Manufacturers, all of whom have been in business for over ten (10) years, have market capitalisations of over $2M USD and supply many of Australia and the world’s leading furniture retailers. Handmade with the finest materials by skilled craftspeople, we are confident we offer Australia's highest quality replica furniture. Our materials are second to none. There is no seller of replica furniture anywhere in the world who offers finer materials. As we offer products that are both in-stock and custom made, delivery times can vary. For in-stock items, we aim to dispatch them with 48 hours of your order, and depending on the courier service, they can take 1-5 days to arrive. Regional areas may take longer. Custom made items have varying Lead Times of anywhere from 6 - 8 weeks to 10 - 14 weeks (depending on, amongst other things, how full our cargo containers are at any given time). We try our best to keep delivery times to a minimum though on occasion there can be delays due to production schedules, port congestion or bad weather and Customs clearance. Please note that stated Lead Times are estimations and not guarantees; they can be both shorter or longer depending on 3rd party providers and logistics. Please note that stated Lead Times refer to the item or item's arrival into our Sydney warehouse. Final courier delivery, whether to Sydney or Melbourne metro or to regional WA, is not included in this period. The time required for courier delivery is in addition and will depend on your location. Please refer to the LEAD TIME Tab on individual product pages for that item's delivery information and expected time of arrival into our Sydney warehouse. When your item(s) arrive in our warehouse we will contact you directly to check your delivery details and organise final delivery. Please note that storage charges will apply to items that are not despatched for final courier delivery or collection within 7 days of receipt into our warehouse. These are charged on a weekly, per pallet or part thereof, basis. No. Items can only be delivered to an Australian address. When placing your order, be sure to create an Account. This will allow you to follow the progress of your ordered item(s) through the production, shipping and delivery cycle and you will receive email alerts at each stage. Please note that we are a furniture company who uses external couriers. Australian couriers are not removalists and as such are not required to unpack cartons, assemble products or remove packaging. Delivery is by sealed road access only (not by air, ferry or unsealed road). Our standard delivery service is a 'kerbside' delivery service, meaning that the driver is not obliged to assist with bringing the item(s) inside your property. If you are in Sydney, Melbourne, Brisbane, Canberra, Adelaide or Perth metro or nearby regional areas and would like an assisted delivery service, contact us directly on 1300 797 277 or [email protected] and we will seek to organise a quote for you. Additional charges will apply. For bulky or heavy items, you must have 2 or more able-bodied persons at your delivery address to receive your goods. This is your responsibility. If this is not possible, please ask us to source or quote a specialist removalist service in your area. Please note that storage charges will apply to items that are not despatched for final courier delivery or collection within 7 days of receipt into our warehouse. These are charged on a weekly, per pallet or part thereof, basis. All purchased items can be returned for any reason (including change of mind) within 14 days of delivery. Items purchased on this basis can be returned for a full 100% refund. The existence of this Re-Stocking Fee means that these items are priced at a lower margin - they are at least 30% cheaper as a result. Please ensure that unwanted products are returned to us in the same condition they were delivered to you. Upon successful inspection pass, you will be refunded the purchase price within 5 working days. If you would like to return a purchased item, please either call us on 1300 797 277 or email us. Please contact us immediately before it gets processed or dispatched! Please call us ASAP 1300 797 277 or CLICK HERE to email us. Place a new order for the desired item. Click here for information on Returns + Refunds. Online security is vital and you should never disclose your personal or financial details without due diligence. Certainly, you should never - ever! - submit your credit card details over an unsecure link (eg: email). We use a premium grade 128-bit SSL Encrypted Certificate developed and supported by global leader GoDaddy.com and you can verify the integrity of this certificate by clicking on the green and white coloured "GODADDY.COM VERIFIED & SECURED" badge found at the bottom right hand corner of every page of this website. We use eWay, Australia's leading online payment provider for all credit card transactions (we neither receive nor store credit card details) and PayPal, arguably the web's safest payment method. Sorry, we do not offer a Lay-Buy facility. Sorry, we do not accept direct deposit. Yes. Your personal and payment details are private and will not be shared with third parties. For more information on Online Security, please click here.